This is a roomy basement level apartment with plenty of natural light , and a a private entrance situated in a beautiful South Jordan, Utah neighborhood. 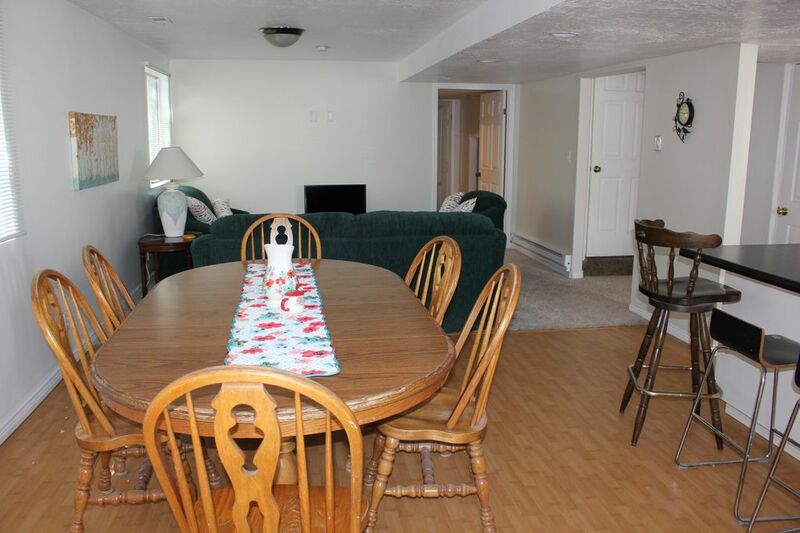 It has a fully stocked kitchen, plenty of relaxing space, and comfortable dining and seating areas. There is a new washer and dryer, new toilet, in a room by itself, and now, another toilet also in a room separate from the bathing facilities. These toilets, separate from the two bathing rooms (one with a sit down shower and sink, and one with a tub/shower and sink,) are especially convenient for large groups where showering, bathing, and toileting can all be accomplished privately and simultaneously .This is a wonderful bonus for large groups with places to go, and many to get ready in a hurry. Photos of the additional toilet area are forthcoming. To the south, the Aquarium, Thanksgiving Point. the Wasatch Range are thirty minutes to the east. There is easy access to Salt Lake Intl. airport. laundromats, there is an on sight washer and dryer. Parking is available for up to four vehicles. Comfortably sleeps up to 15 people, with an additional safe space for baby. Wifi available. I am Laurie Pratt. I am the owner of The Joe Cool Company. We manufacture thumb abduction splints, primarily for children with cerebral palsy, and other conditions that affect the use of the hand. I employ one of my daughters who lives in Arizona. I have 6 adult children, and 15 grandchildren, living in Colorado, Arizona, and Washington. We purchased this property because of the layout. One of my sons uses a walker and wheelchair, and the bedrooms, bathroom, and laundry on the main floor are easily accessed for him. Additionally, the property itself was appealing, as it can be used in many different ways, zoned as horse property. We have not had horses, but have had goats as a 4 H project years ago for one of my daughters. We have used the garden level area for several different things. Office space , extra rooms for visiting family, year to year rental, and now with VRBO. Nice side yard, is with beautiful potted plants, and access to additional large cemented area with basketball hoop. Lawn chairs, out door play equipment for children. Also inside, we have placed extra mirrors near outlets in all bedrooms and in the semi private room so more people can get ready at the same time. toilet, shower, shower with sit down feature, sink and vanity with mirror. Bathroom in the master with sink and vanity, and miror, and large shower, with sit down feature. Down the hall is a separate room with a toilet. Next to that room, another room with a toilet and the washer and dryer. Down from that another bathroom with tub/shower, sink and vanity and mirror. electric baseboard heating in north rooms, with separate thermostats for individual room comfort. mattress pads, fitted sheets, flat sheets and 4 pillows with pillow cases for all beds, as well as duvet covers . Additionally, there are extra blankets in the large room closet with the bunk beds. There is room for up to 4 cars on the south side of the house. plenty of towels for stored in both bathrooms. The living room has a large couch, love seat, and over stuffed chair. It has an end table with a lamp, and another little table with the smart tv on it. There are pictures with an "aspen" theme . side by side refrigerator/freezer with ice maker and water dispenser. two complete sets of dishes, as well as children's dishes. Knives, pots and pans, cookie sheets and cake pan. Crock pot, and electric griddle. large kitchen with plenty of room for more than one cook. Built in pantry, garden level sink with south facing window above it. Long counter /bar for serving, eating, and food preparation. large dining room table seats 6 and kitchen counter/bar seats another 6. 2 smart tvs, one in the master bedroom, and one in the living room. There are some books both for children and adults. There are some family games, as well as a variety of puzzles. There are some dolls, trucks, large lego, small lego, and children's crafts. Also some outdoor play equipment. There is a side yard for use of renters with a flower garden and potted plants. Also a large cemented area with a basket ball hoop. There is also a futon, with bedding for it, as well as another futon mattress with bedding. This is in addition to the beds for 13. There are mirrors near outlets in all the bedrooms, and in the semi private room, so everyone has a place to get ready for the day or event. Lots of square footage for a large family. Laurie was great to work with. Great kitchen facility. Nice towels. Lots of sleeping options. Toilet and bathroom setup optimizes user convenience and privacy. Well taken care of. Thank you for the nice review. We enjoyed having you, and so appreciated your talent! Come back anytime..
Had a great time with my family. Convenient and very clean. Quiet neighborhood, great for a family vacation. We would love to have you come back any time! Our large family, with a newborn grandson in tow, came to visit other family members in SoJo. We drove up the driveway in a snow storm to the owner shoveling off the stairs and driveway. We did not call ahead to tell her the time we'd arrive (it was 9-10pm) and she was out there doing that! The apartment (which was huuuge) was warmed and bread waiting on the counter for us! the place was spotless, t he bedding was fresh and clean and I wasn't grossed out when my bare feet touched the ground (which in hotels I WILL NOT go barefoot! We will stay here again and again! I highly recommend! Thank you Sally, for your wonderful and kind review! You left the apartment so clean and cared for, I appreciate that so much. We were in town for a funeral with three families staying here. It worked out perfectly. The place was clean and roomy. Owner Laurie was very accommodating and great to work with. We enjoyed staying in Laurie's rental over Christmas with our extended family. We had plenty of room for all 12 of us. The bunk room was perfect for the kids and the other three rooms allowed couples to have their privacy. The bathroom arrangement was great for a group and we all got ready for a wedding without issue. The kids enjoyed playing in the yard in the snow. This isn't a fancy place, but it is very clean and functional for a family to enjoy. Nice large kitchen for cooking. We had everything we needed: comfortable beds, iron, kitchen had good pots and pans,enough dishes, shampoo, towels, toilet paper, washer/dryer, etc. If we find ourselves back in the area for vacation we would love to stay here again. Laurie had everything ready and is a great hostess. Come back any time, we’d love to have you. South Jordan is near both I 15, and Bangerter Highway. These provide easy access to restaurants, mountains, picnicking, hiking, as well as the zoo, This is the Place, and many other sights. Additionally, here we have great shopping, 2 LDS Temples, many restaurants and movie theatres, as well easy access to the Hale Center Theater, and Real Soccer.